NETWORK UPDATE: THE FLASH and THE VOICE had 0.1 bumps for their season finales, as did the first hour of HELL’S KITCHEN, but IZOMBIE lost 0.1. CABLE HIGHLIGHTS: Sports crowded the top of Tuesday cable, with ESPN’s NBA PLAYOFFS Golden State/Houston game at 2.89, and the NBA DRAFT LOTTERY at 1.47, as well as NBC Sports Net’s NHL PLAYOFFS game at 0.71. The highest-rated non-sports telecast was Discovery’s THE DEADLIEST CATCH, down 0.02 to 1.02, with lead-out SONS OF WINTER down 0.06 to 0.36. OWN’s IF LOVING YOU IS WRONG gained 0.09 to 0.70. On Comedy Central, TOSH.0 dropped 0.12 to 0.58, and INSIDE AMY SCHUMER fell 0.13 to 0.35. 19 KIDS AND COUNTING (TLC) rose 0.07 in its 1st hour and lost 0.17 in its 2d hour to 0.51/0.57, with THE WILLIS FAMILY down 0.11 to 0.32. Bravo’s REAL HOUSEWIVES OF NY was down a tenth to 0.47. YOUR FAMILY OR MINE (TBS) gained 0.02 to 0.40. 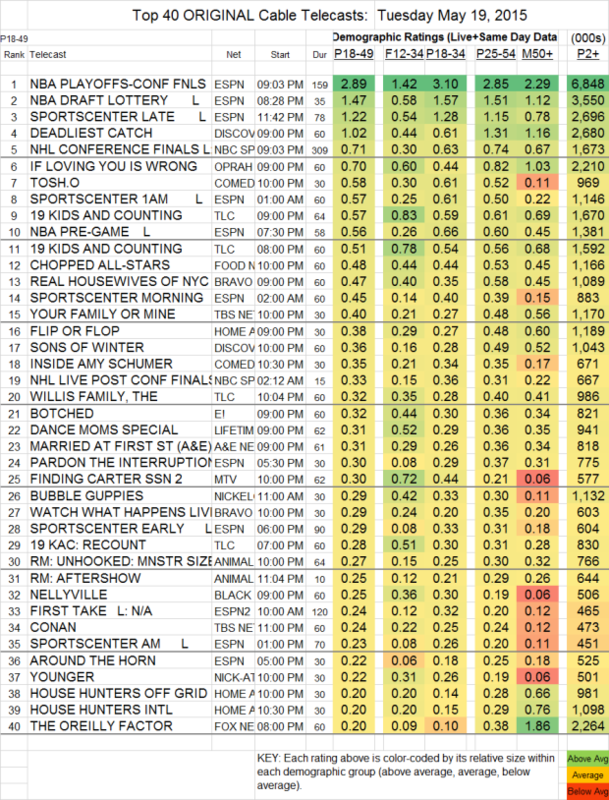 On E!, BOTCHED was down a tenth to 0.32, and GOOD WORK fell 0.08 to 0.19. MTV’s FINDING CARTER, just renewed for a 12-episode back order, was down 0.08 to 0.30, and also down 0.12 in the F12-34 demo to 0.72. YOUNGER’s airing on Nick At Night slipped 0.02 to 0.22, and on TV Land it slumped by 0.09 to 0.12.